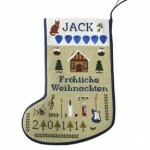 This Christmas Stocking was just such a case where its ‘non designer’ had created something very special using all sorts of motifs that mean a lot to the lucky recipient. 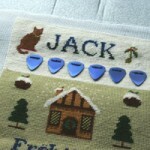 Clearly it is intended for a young man who plays the guitar, so she had also added a row of real plectrums – I didn’t realise plectrums had little holes to make them easy to stitch onto tapestry! We had to be very careful because she warned us the plectrums can scratch, so just to be safe, I stitched a piece of thin fabric over them before I began the stretching process. It stayed there throughout the stretching and making up until the finished stocking came back from my Christmas Stocking Lady! By the way, Fröhliche Weihnachten means Happy Christmas in German.